Samsung has started working on Upcoming Galaxy Note 9 Smartphone. 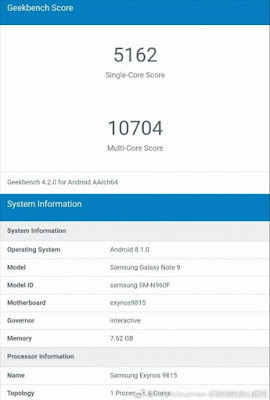 Samsung Galaxy Note 9 SM-N960U with Snapdragon 845 has been listed on Geekbench Now Exynos variant of Galaxy Note9 (SM-N960F) with Exynos 9815 SoC has been spotted on Geekbench. 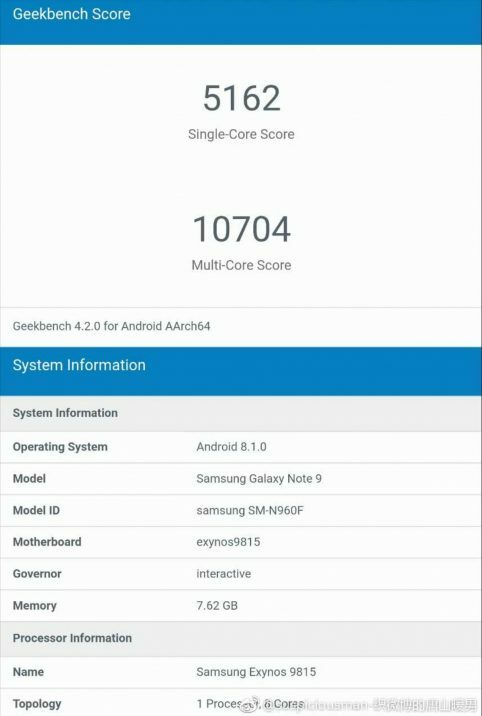 Galaxy Note 9 Expected to sport the 6.3-inch display, Snapdragon 845 and Exynos 9815 processor 6GB/8GB RAM, and the dual Rear camera. wireless charging and an In-Screen fingerprint sensor.3850mAh Battery.